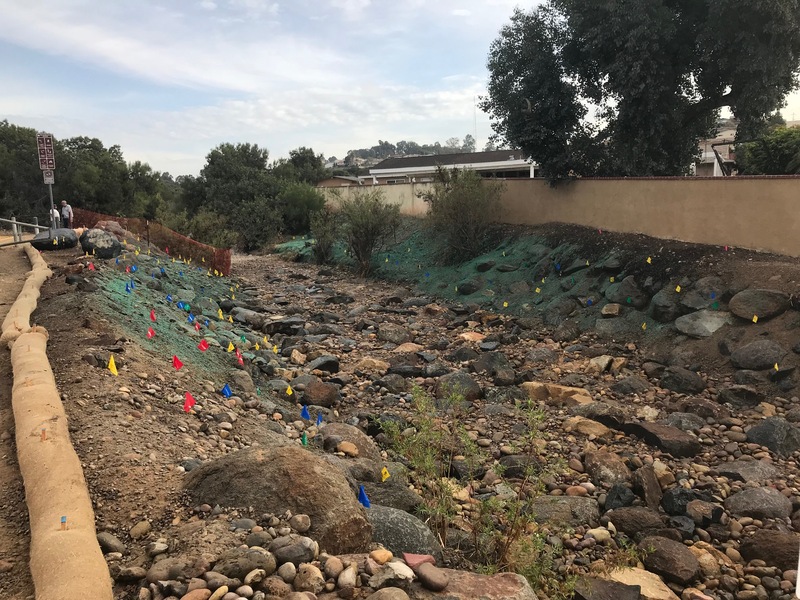 Groundwork San Diego has been awarded a grant from the California Department of Water Resources through San Diego County’s Integrated Regional Water Management (IRWM) program to complete the planning phase for two projects in Chollas Creek. 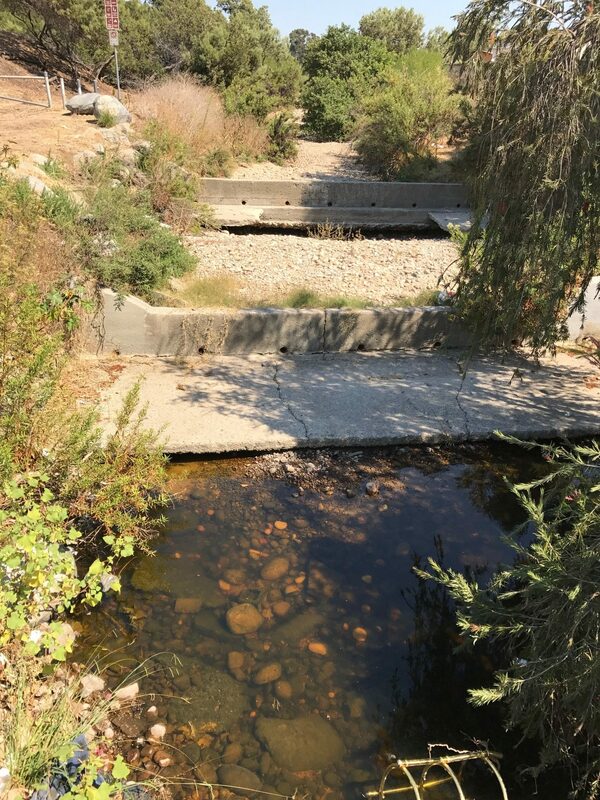 One project will remove invasive nuisance plants along portions of the creek, and the other will restore the portion of Chollas Creek that runs along Federal Blvd between I-805/Beradini Field and Home Ave. 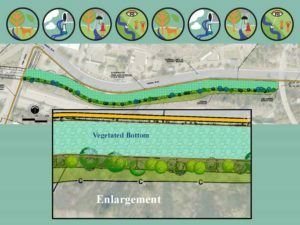 The Federal Blvd project will include removing the concrete channel and replacing with a soft bottom, planting native vegetation, and installing a trail along the edge of the creek. 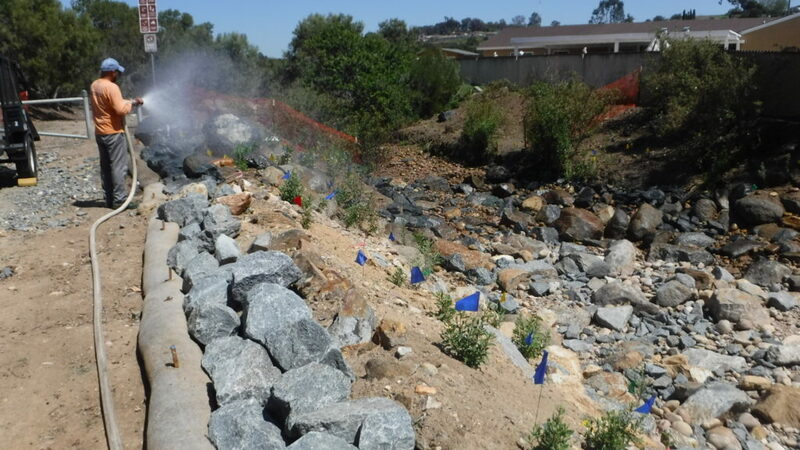 This is one of the important trail connections that will one day provide Chollas Creek Watershed residents a pedestrian/bicycle trail from La Mesa to the Bayshore Bikeway! 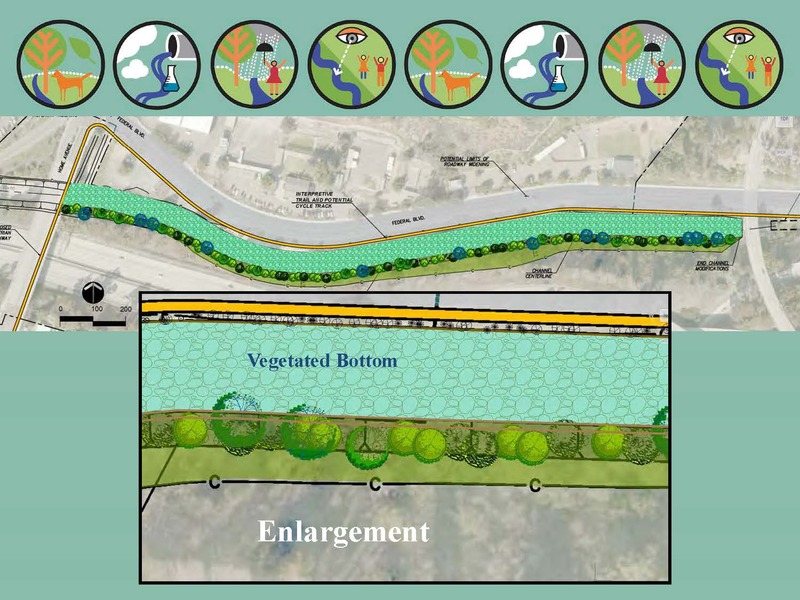 Concept drawing of future Chollas Creek along Federal Blvd. November and December have been incredibly busy and successful months. So many smart students from all of our participating schools! Seventh graders from MTM took a field trip to the Torrey Pines Reserve to learn about native habitats and plant and animal adaptations. The Canyoneers hosted the trip and their trail guides were great. 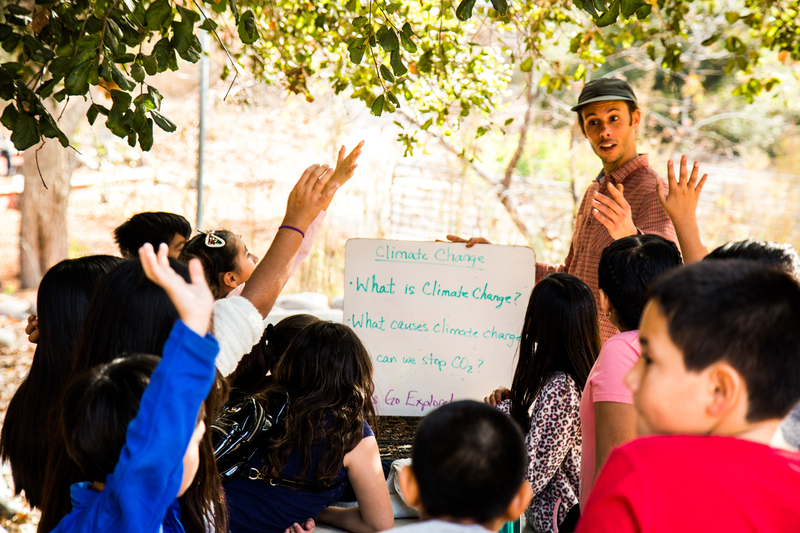 Fourth graders from Chollas-Meade just finished a unit on Climate Action and Stormwater Pollution. What amazing environmental stewards these students have become. 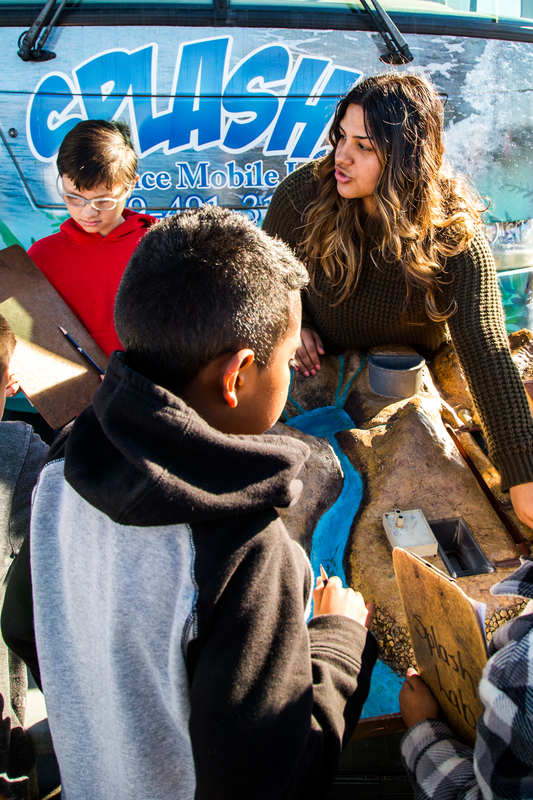 Sixth graders from MTM concluded their unit on Water Quality & Conservation, with an interactive, vibrant four day visit from the San Diego County Office of Education’s Splash Lab. Thanks to their teachers for such a successful course. ProKids just finished a three month curriculum on Pollinator Gardens and Environmental Conservation. 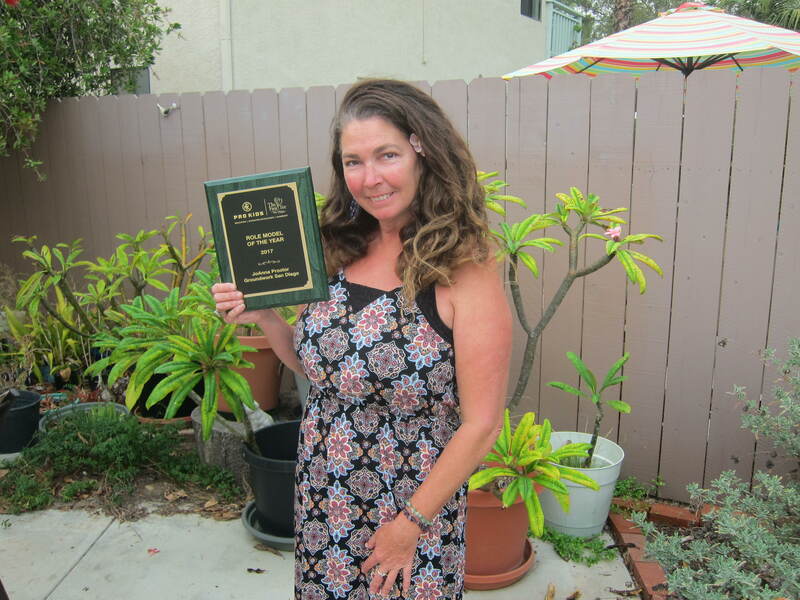 EarthLab Education Director, JoAnna Proctor, received an award from ProKids, Role Model of the Year! The awards ceremony was filmed and showcased on the Golf Network. 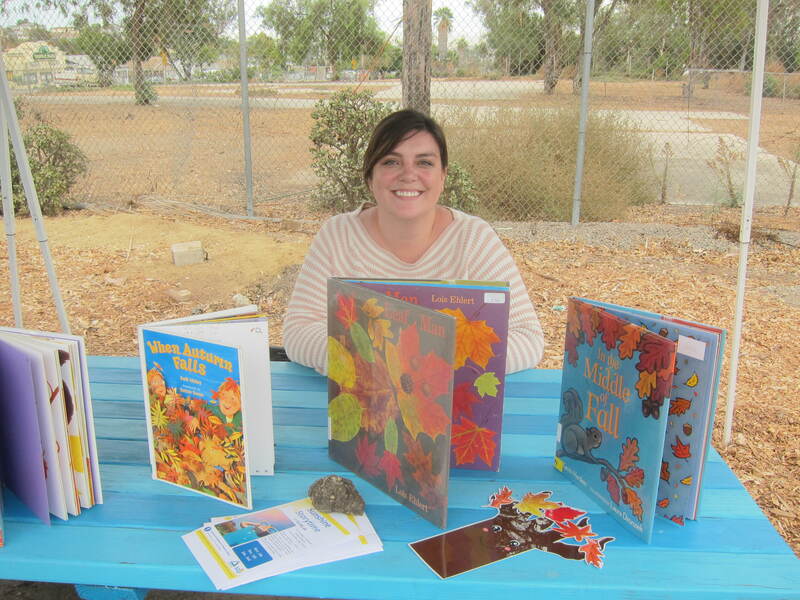 EarthLab’s new “Sunshine Storytime” for families is a brilliant new partnership program with Malcolm X Library. Thanks to Miss Cassie for her collaboration and dedication. 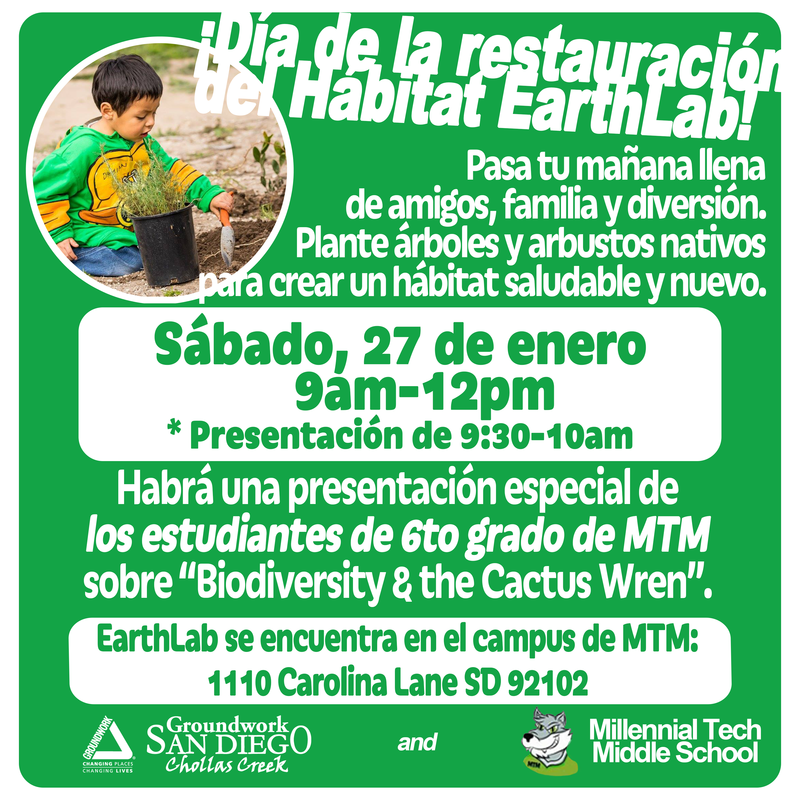 Finally, EarthLab’s “Saturday Science & Service Club” is going strong, with each Saturday offering a unique set of experimental, hands-on activities for students and their families. It has been an educational and successful year thus far, and we are all looking forward to more fun and learning in 2018. Wishing all of our friends, supporters, partners, teachers, administrators, staff, students, and families a beautiful holiday season and a brilliant new year. Happy Holidays! 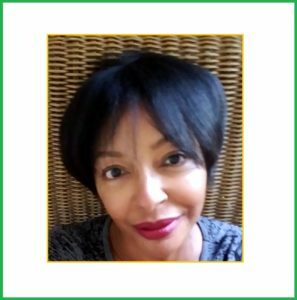 Groundwork San Diego is pleased to announce that one of our key staff members, Ms. Muriel King, has been appointed to the Urban Forestry Advisory Bd for the City of San Diego. Below is a statement she’s written about her new position. Congrats Muriel! My name is Muriel King. I was recently appointed by the City of San Diego to represent District 4 as a board member on the City Urban Forestry Advisory Board. My appointment was influenced by years of work I performed in District 4 to improve the urban environment with drought tolerant trees, other plants and landscape maintenance in my own community of South Bay Terraces; and more recently the work I have performed at The EarthLab, located off Euclid to develop a Conservation Garden that will open to the public soon. The City Urban Forestry Advisory Board was established as a vehicle to encourage the City to comply with its Climate Action Plan and more recently the Mayor’s motto “Neighborhoods First” for a healthier environment that is conducive to lowering city temperatures, reduce heat illness and provide places to be physically and socially active. This is in alignment with the efforts of the Urban Collaborative Project—to create, sustain and enhance better living environments. Trees and landscapes—not concrete make an environment a friendlier and safer place to live, which is the general purpose of many of you who are part of community organizations and civil service. In addition to improved heath, research shows that greener spaces with trees create friendlier neighborhoods; therefore, safer neighborhoods. Let’s create healthier and safer neighborhoods with greener spaces for people to relax, gather and enjoy outdoor activities. 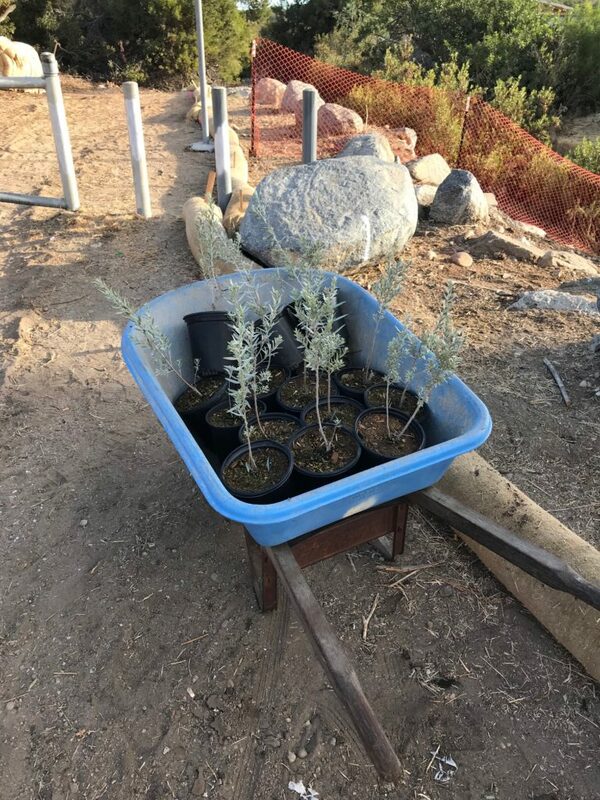 To start, you can request a drought tolerant, free tree or trees to have planted along your right of way through https://www.sandiego.gov/trees/planting. Requests can also be done through the City’s Get It Done app. Select “New Report.” From the “service category”, select “Other.” Tap “Location” to provide the address for the free tree or trees. Enter FREE TREE in the description field. Enter full contact information in the “My Info field.” and submit. 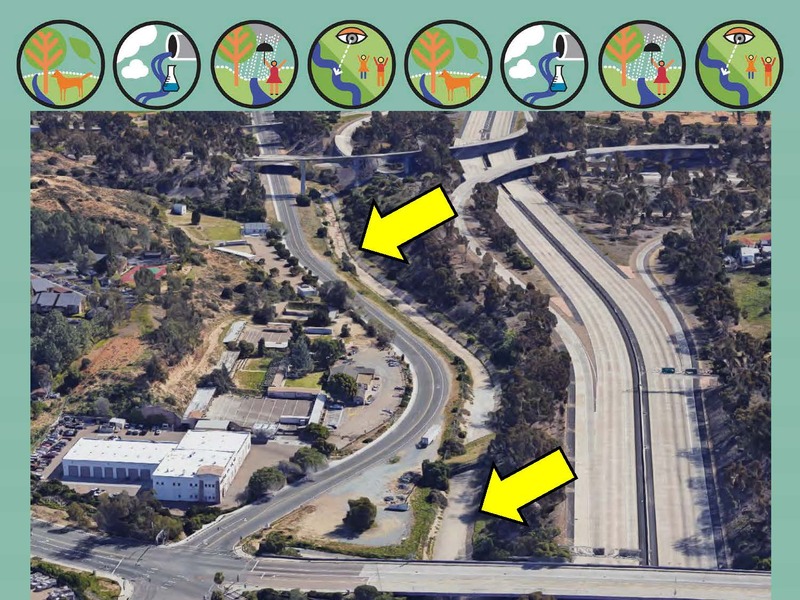 The City also has a tree selection guide at https://www.sandiego.gov/sites/default/files/legacy/street-div/pdf/treeguide.pdf that provides information about trees recommended for use in the public right-of-way. Become a green space advocate with the use of drought tolerant plants and trees for greener, healthier friendlier and safer communities. 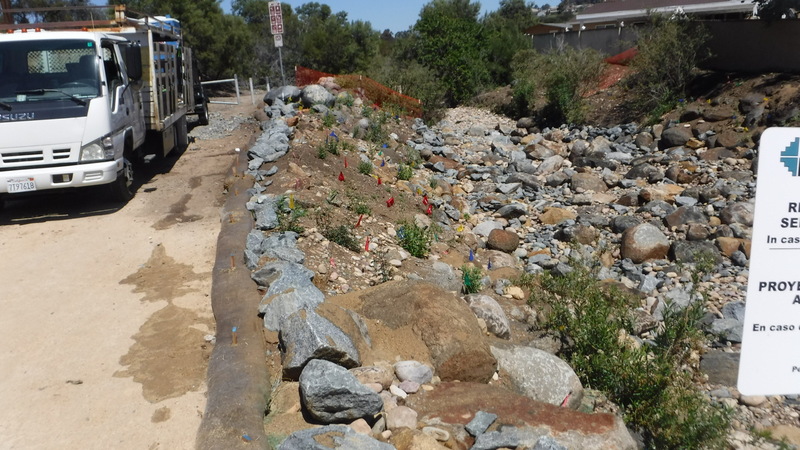 Start today by contacting the City for a free drought tolerant tree! Groundwork congratulates Mike Chee and Chad Haza for their Environmental Star Awards this week! We’re so thankful for all of our supporters! To every volunteer, parent, dreamer, neighbor, partner and promoter who helps us work as one – THANK YOU! These photos are a strong reminder of what all of your help amounts to – this season we’ve managed to complete the Pocket Park on Euclid! A special thanks goes out to the Mission Continues and Wounded Warriors who contributed their Saturday morning and their money to finish planting the park. It looks so beautiful and we can’t wait to pay it forward by opening it up for the pleasure of the public! Hope you have a fulfilling and filling Thanksgiving everyone! 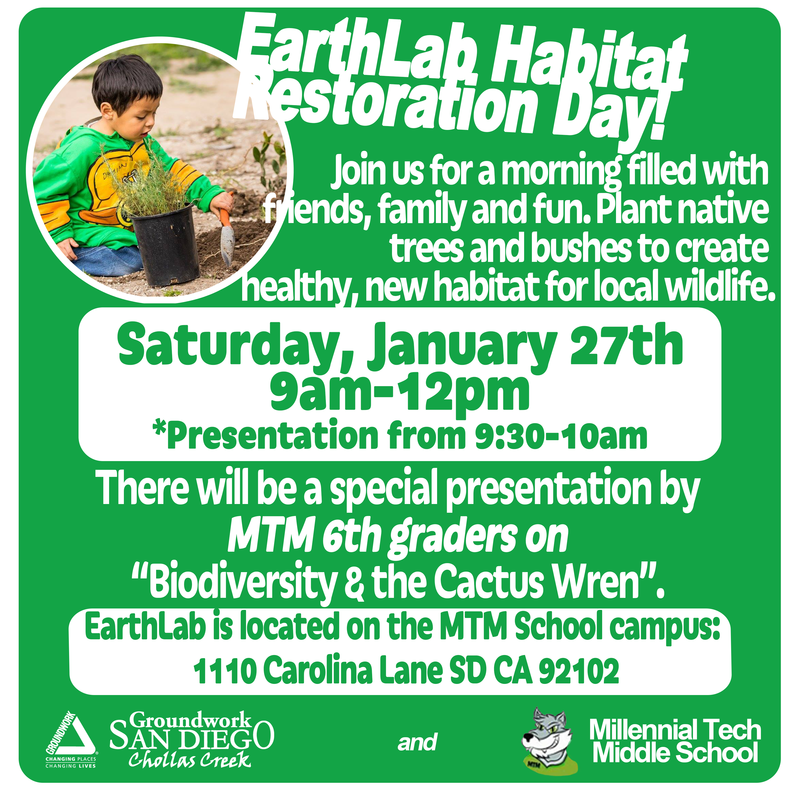 Join us in building our Earthlab Pocket Park! This beautiful space is humming with life and we need your help to make it truly sing! By working together, we can make this a space that we all can enjoy. 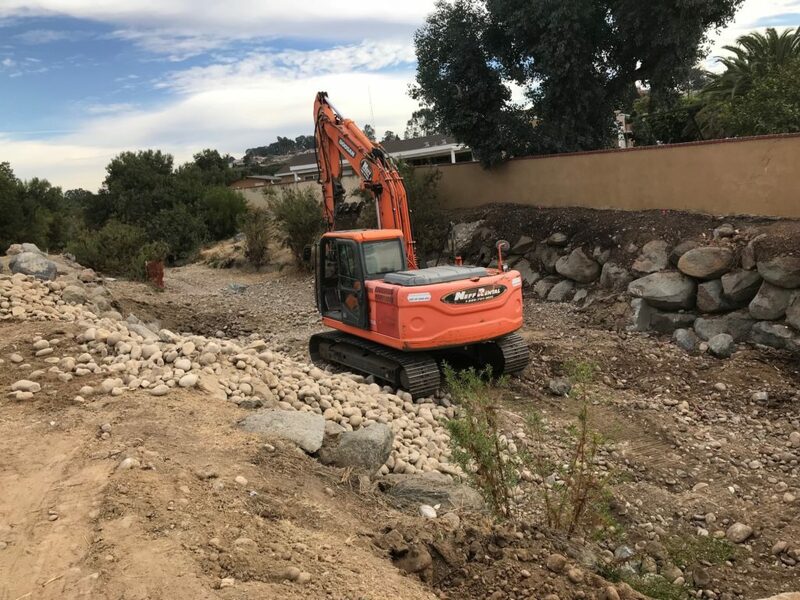 We’ll be building among the butterflies and the birds as we create a childrens’ play area, beautify our fenceline, paint bright murals, establish demonstration gardens, and put up a farm produce stand. We bring color to our Earthlab, painting with passion! Call Patrice Baker at Groundwork San Diego to make a reservation. Take the 94 and turn South onto Euclid. Turn right onto Lakiba Palmer, right on Dassco, right on Hilltop, left on Carolina … Park at Gomper’s Park on Carolina Lane, walk past Millenial Tech Middle School until you reach the fenceline and turn up the road to your right. Amidst the whirring of brushcutters, tinkling of glass bottles and the bellow of tuba music from passing cars, volunteers at Southcrest Community Center yesterday tackled a creek full of giant reed in celebration of the international Coastal Cleanup Day. It was a feat of teamwork, strength and good spirit and we finished the day with a cleaner creek! NASSCO and Las Hermanas volunteers teamed to remove giant reed (Arundo donax) for Coastal Cleanup Day. Thanks everyone! It’s amazing how one tiny speck can turn into a weedy wall of impenetrable giant reed (Arundo donax). With each passing storm, Giant Reed sends little bits of its roots into the passing flow to establish dense new stands downstream. The new growth soon becomes so thick that one can’t even walk through the mess, and it later clogs storm drains and litters creekbeds. It’s also spectacular what one tiny spark can turn into a warm glow of inspiration. More than 50 volunteers came out early on a Saturday morning to haul away Arundo and make room for lush trees like willows, oaks and sycamores. The success of the event was largely due to the amazing organizational capabilities, dedication and generosity of the employees and their families at General Dynamics – NASSCO. Also lending a hand were Las Hermanitas and various community members from the neighborhood. Assemblywoman Lorena Gonzalez joined the team to yank out castor bean (Ricinus communis) before it even had a chance to set seed! And just up the road at Emerald Hills Park, over 300 volunteers gathered together to remove trash from our precious Chollas Creek. To all of the volunteers who helped for Coastal Cleanup Day, any day and every day to keep our creeks and oceans clean…thank you! We’re proud to be part of a community that cares.